In the boys’ adventure stories I would read sixty years ago, the baddies often spoke in ‘guttural’ tones. Not only German and Arabic, but also Welsh, Hebrew, and Dutch are still occasionally referred to popularly as ‘guttural’ languages. The guttural nasal seems to have been the regular pronunciation of ng in English. By non-phoneticians any mode of pronunciation which is harsh or grating in effect is often supposed to be ‘guttural’; with this notion the designation is popularly applied by English-speakers to the German ch, but not to k or g, though technically it belongs equally to them. As a technical term of phonetics, the word was first used to denote the Hebrew spirant consonants א, ה, ח, ע; it is now commonly applied (inaccurately, if its etymological sense be regarded) to the sounds formed by the back of the tongue and the palate, as /k/ /g/ /x/ /ɣ/ /ŋ/. As a phonetic term ‘guttural’ has now been entirely supplanted by more precise terms: mainly ‘velar’, but also ‘uvular’, ‘pharyngeal’ and ‘glottal’, as appropriate. The non-technical use of ‘guttural’ has declined in parallel, and has not been replaced by ‘velar’ or anything other phonetic term. Here is part of the Google ngram for ‘guttural’ (blue) and ‘velar’ (red). Follow the link to view the whole graph. 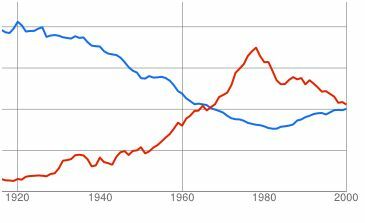 As you see, the crossover point at which ‘velar’ became more frequent than ‘guttural’ was as recent as the late 1960s. But if we follow the trend lines for 1990-2000 and extrapolate for 2000-2010 we might well find that it has now lost that lead. Fooled me into reading "Google ŋgram". I'm relieved to see that the original NED had the missing bracket - must've (or must 'ave) been lost in the computerization process. And obviously there was no IPA in the original: the final list of gutturals read 'k, g, χ [chi], γ, ŋ'. Interestingly, the order of the Hebrew letters mentioned was also reversed in the computerization process. "Interestingly, the order of the Hebrew letters mentioned was also reversed in the computerization process." - No doubt by an overzealous algorithm trying to impose right-to-left order on Hebrew. Indeed, and I've just noticed that the commas are misplaced. It would be interesting to see how it is in the print edition of the 2nd edition: it may be an artifact of the web conversion or the old CD-ROM version. If I remember correctly, most Hebrew script was replaced by roman transliterated forms in etymologies. The commas are placed like they would be in Hebrew typesetting. This is one of the few technical terms used by laypeople that have a reasonably well-defined meaning. Methinks Mr Wells in his Dictionary explains somewhere what 'clipped' (vowels), a British specialty, is supposed to mean. As opposed to 'drawled' American vowels. I (a layperson) use "clipped" to refer to vowels that sound shorter than I would expect. I think I often get this impression when there is a glottal stop following the vowel, either reinforcing another consonant or on its own, as there often is in English accents. I don't know what other people mean when they say it though. I don't use the term flat, but other people seem to use it to describe any vowel in any accent other than their own that is pronounced differently from the way they pronounce it. I've also heard it used to describe accents that have these "flat" vowels. I think the general use of "guttural" is just a derogatory term about the sound of a language, often used about German, and I've never heard it used about Spanish because the stereotype is that it sounds more pretty. Both of course have /x/, and I've no idea which of the two has it with greater frequency. I'd hazard a guess that also German /ç/ and even Welsh /ɬ/ qualify as "guttural" under this general mud-slinging definition. I'm sure it can be derogatory sometimes, but I've also heard it used simply as a descriptive term by laypeople. I heard a native speaker of Dutch say to me, "Dutch has a lot of guttural sounds." She didn't seem to have any ill feelings toward the language. She was just trying to describe the language to me without a specialized vocabulary. @Alan - that's because German is guttural but Spanish is "mellifluous". Does guttural still have any utility as a collective term for the velar and post-velar points of articulation? The Spanish and German /x/ and the Brazilian Portuguese /r/, for example, can vary between velar and uvular allophones, and it would seem convenient to have a catch-all term for them. A Spaniard said to me the jota was a very "strong" sound, "that's why we use it for swearing" - referring, no doubt, to joder (xoˈðeɾ). Whether the etymology bears this out I don't know, but at least that's the impression the sound makes on a native speaker. For some strange reasons, and if my observations are not too biassed, a growing number of literate English-first language persons write the word as 'gutteral'. I'd suspect that what they call the 'guttu/eral' sound of German is due not just its frequent 'ch', but to the fact that the glottal stop is so frequent in German too: 'eine alte Eiche', an old oak-tree, has a glottal stop in front of every initial (in spelling) vowel. Similarly: Post'amt, Alt'oetting, Blumentopf'erde, and many others... Dutch is still more guttu/eral (in terms of 'ch', spelt in it also 'g') but has no glottal stop (to speak of) and no such bad reputation, either. well, I was thinking 'literate except for writing "gutteral"'. Not very latinate, in any event, as every such person should know his/her, 'guttur-gutturis, n., III decl.'. Besides, I am not sure if the Hebrew 'א' (alef) have ever been a 'spirant' (fricative?) consonant, I used to think it had been used for the glottal stop (and is not pronounced at all in contemporary standard Israeli Hebrew)... wrong? Also popular is “hard” and “soft” consonants, which similarly seem to have no nailed-down meaning. 'Hard' and 'soft' have a very precise meaning in the phonology of Russian and related languages. 'Soft' consonants have the secondary articulation of palatalisation. Hard consonants don't. Wojciech says we call our palatalised consonants 'soft'. This is not as 'nailed-down' a pronouncement as it could be. Rather I'd say palatalised consonants are called 'soft' by everybody (even by phoneticians) — and 'soft' means nothing but what phoneticians called palatalised. In Polish, Russian, etc of course. Unrelated languages use the terms in unrelated senses. In Russian, at least, it's still a meaningful concept - soft consonants are palatalized, while hard consonants are non-palatalized and often velarized. In other peoples' usage, it may have some correlation with the sonority hierarchy, with voiced plosives being softer than voiceless ones, and fricatives being softer than fricatives. This is consistent with the linguistic term lenition, which is Latinate for "softening". *fricatives being softer than plosives. 2. confirms the widely held impression that, e.g. standard Italian is more sonorous than standard German. Hence a language that, like standard German, makes heavy use of aspirated stops and voiceless fricatives, has low sonority. A language that, like standard Italian, prefers voiced or unaspirated stops, has higher sonority. @vp... Yes, those rules sound about right, and in most cases they'd produce the same results as the man on the street's ideas of sonorousness. They would also confirm my tentative definition of sonorousness as being the opposite of "gutturality" (see my coment above). You could go further and rank every consonant, apply weights to the rules and so on. But the example we were using was not Italian vs German, but rather Spanish vs German. By most interpretations of your rules German should come out as more sonorous than Spanish, but the man on the street will tell you that Spanish is very sonorous and sweet-sounding (and musical and mellifluous), so something's not right. I don't think so. a Spanish speaker will be using his vocal cords a higher proportion of the time than a German speaker, owing to German's propensity for aspirated stops (and word-initial glottal stops). In addition, the fricatives in Spanish tend towards being approximants. Re: the problem of ɤ appearing in place of ɣ in OED; it was a mis-rendering of an underlying SAMPA G, for which a fix has gone live today as part of OED's quarterly update. If you look at guttural (or razzia, n., wallow, adj. or another half-dozen entries which include ɣ in their definition), you'll now see the right one. For more general information about this June 2012 update, see here. I have always wondered if these terms don't rather reflect attitudes towards the countries and their people who speak the languages.